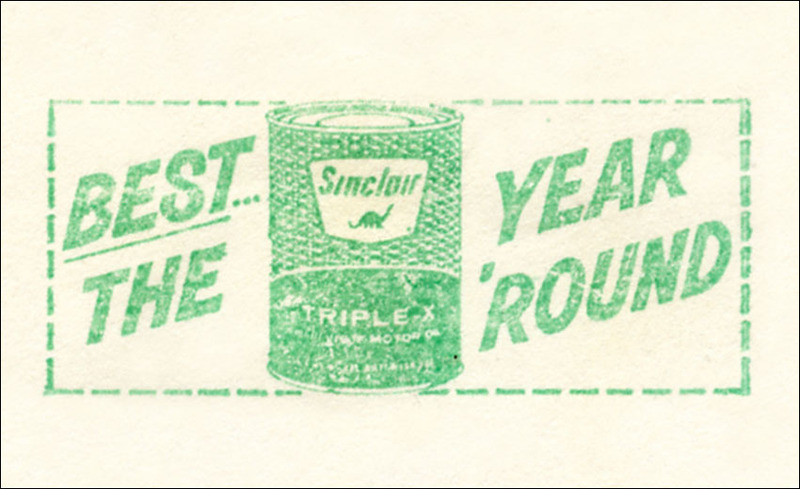 Dates of use for the Sinclair postage meters (Part 1) are not recorded anywhere that I’m able to find, so I’ve started and maintain this listing along with several other collectors (Mr. Saul Friess of Miami, Mon. Dominique Robillard and Mon. Maurice Gardiol of France). 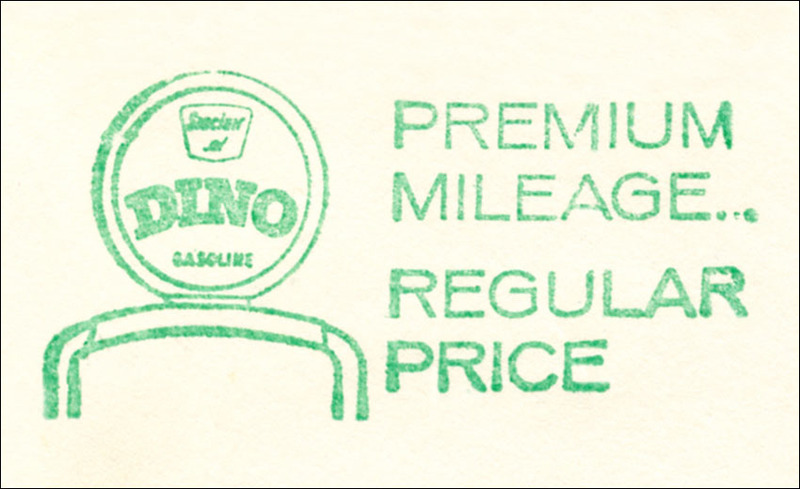 We hope this is of use to you in your search for ‘Dino’ the dinosaur! 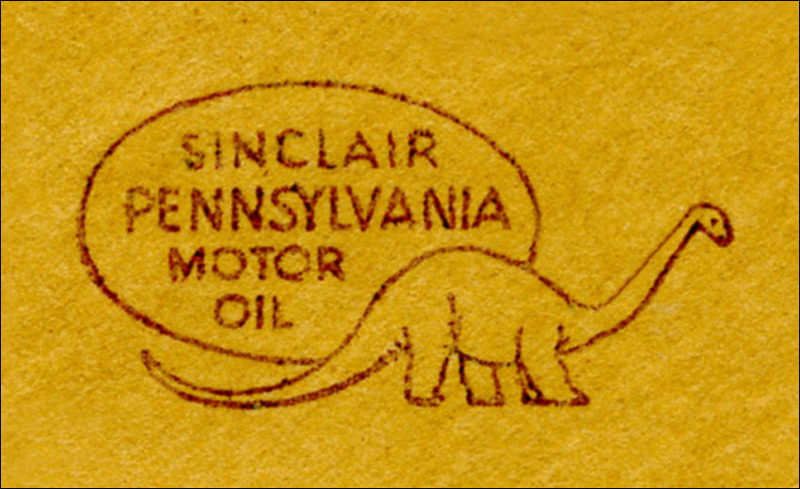 Mail of the Sinclair Oil Company from 1934 through 1968 utilized postage meters with illustrated advertising slugs which included the likeness of a dinosaur. 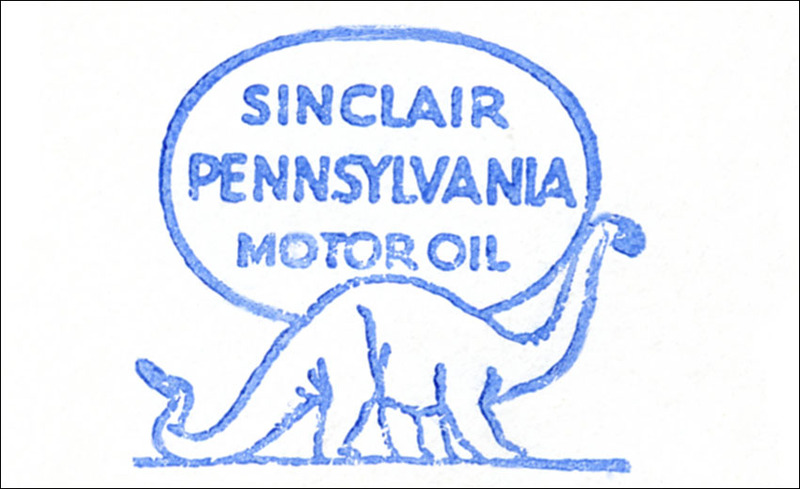 The image of ‘Dino the Sinclair Dinosaur’ as the company logo was used to indicate the age of the raw materials used to make their oil and gas products. Examples of this mail are the earliest items to depict dinosaurs and represent the scarcer philatelic material available in this thematic subject. Over the span of 40 years collecting these meters, nine basic designs of the advertising slug have been recorded from the U.S. and three types internationally. The major varieties on six of the U.S. basic designs are shown below. 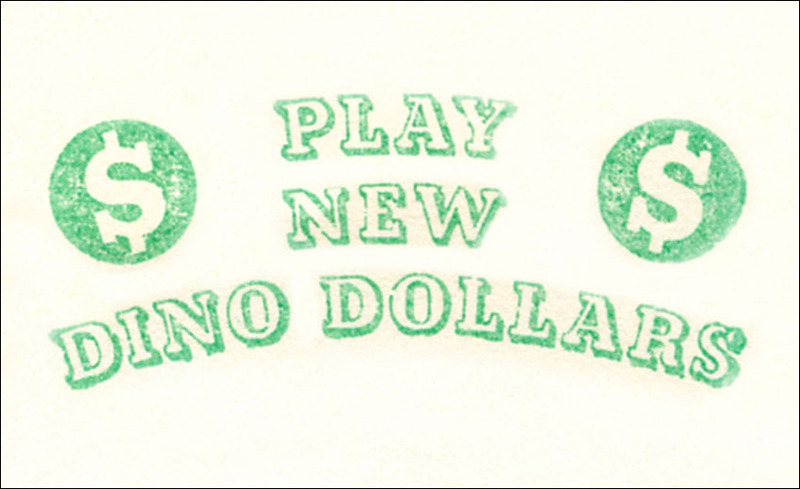 In future posts, we’ll discuss the cities of origin, meter machine numbers, machine manufacturers, corner cards, and sub-varieties such as ink color, are also of interest. For the moment, let’s review only the basic designs. The dates of use listed are those years I’ve been able to verify and they may change as more information is obtained. Your assistance is always welcomed and solicited to further clarify the use of these advertising postage meters. 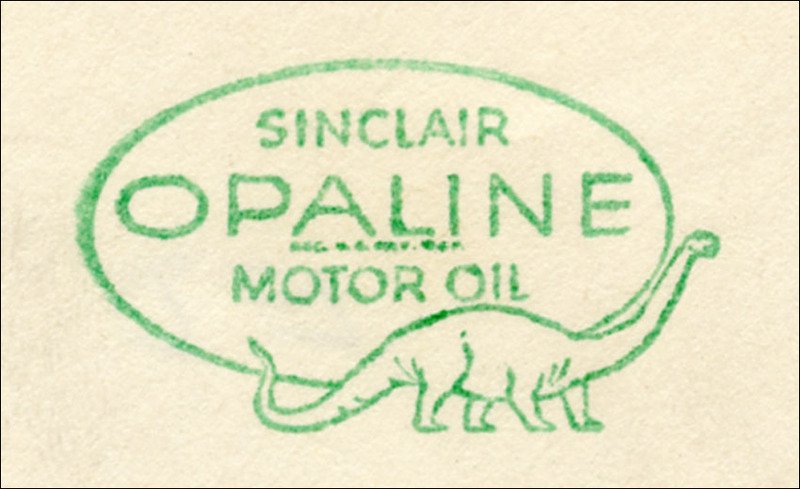 Please note – the words ‘Opaline’ and ‘Pennsylvania’ refer to oil types. 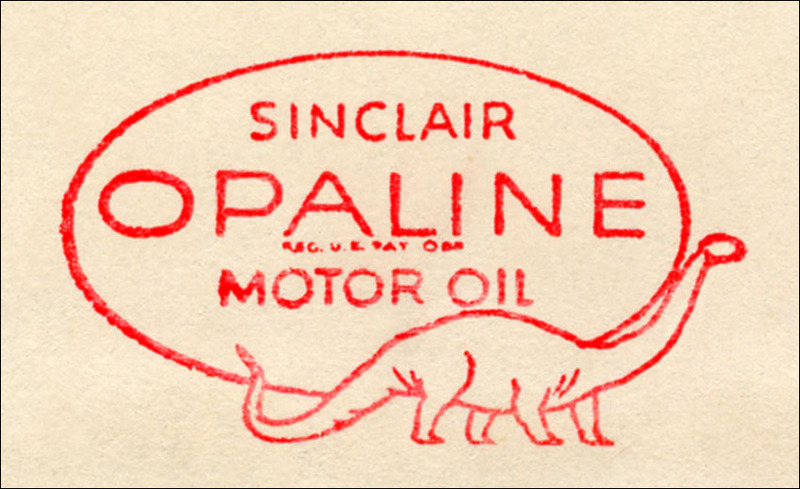 Opaline was a brand purchased by Sinclair and retained its name under Sinclair ownership. Comes in two types. The text bubble is directly above the dinosaur and the dinosaur measures 33mm wide by 16mm high. 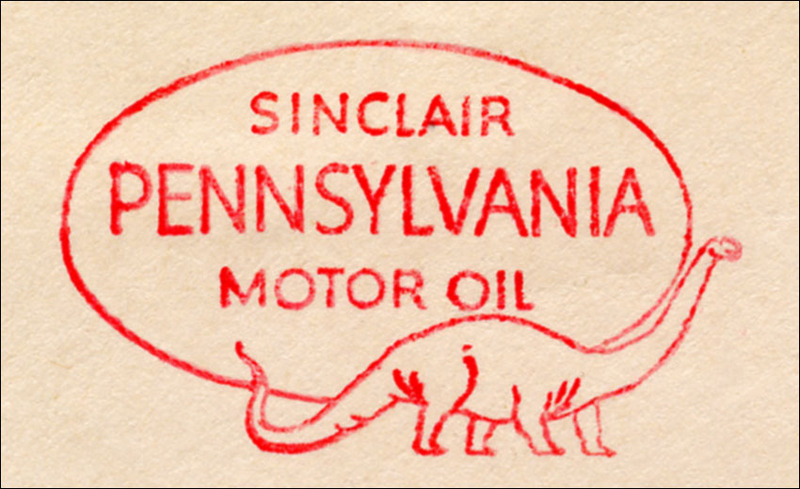 The readily apparent difference is in the text – ‘Opaline’ in the first type as opposed to ‘Pennsylvania’ in the second. The ‘Opaline’ type also includes a small line of text ‘REG. U.S. PAT. OFF.’ (Registered United States Patent Office) below the word ‘Opaline’. Used from 1934 through 1942. Comes in two types. The text bubble is above the dinosaur’s tail and the dinosaur measures 32mm wide by 12mm high. This design looks similar to design 1, but the smaller size of the dinosaur is readily visible. Used from 1934 through 1939. Comes in two types. The text bubble is above the dinosaur and extends to the left. The dinosaur measures 25mm wide and 11mm high. This dinosaur is much more elongated body than in the first two designs. Used from 1940 through 1959. Comes in two types. The text bubble is above the dinosaur and the dinosaur measures 31mm wide and 13mm high. This dinosaur is similar to design 3 but larger overall. Used from 1940 through 1950. Comes in only one type. 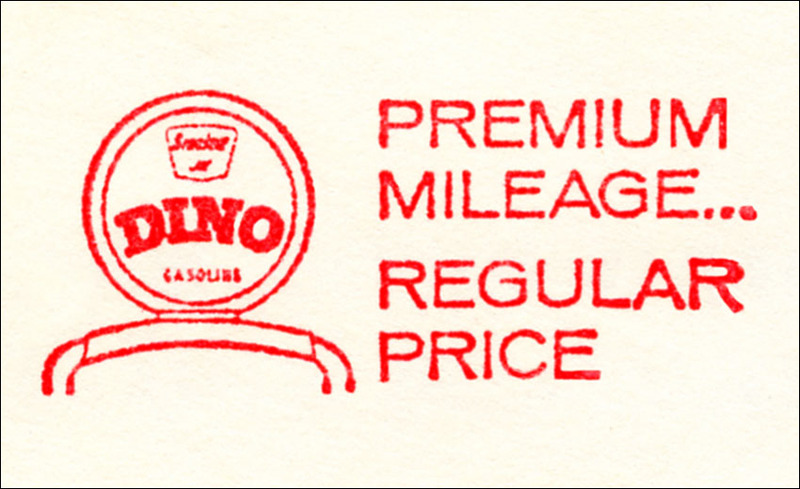 The text is not in a bubble and the dinosaur now wears a jacket, bow tie and hat reminiscent of those worn by gas station attendants of the time. Used from 1957 through 1963. Comes in two types. 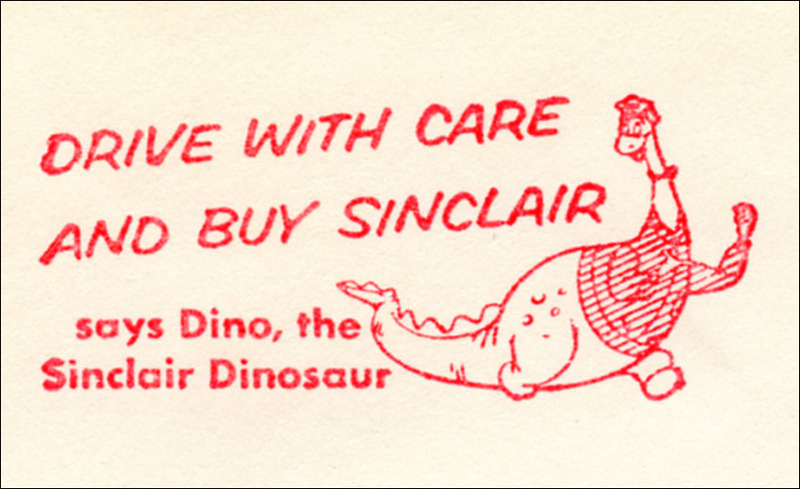 The size of the advertising slug differs, 6a being 44mm wide and 19mm high and 6b being 50mm wide and 25mm high, both with a tiny dinosaur image in the Sinclair logo. Used from 1962 through 1964. Comes in only one type. 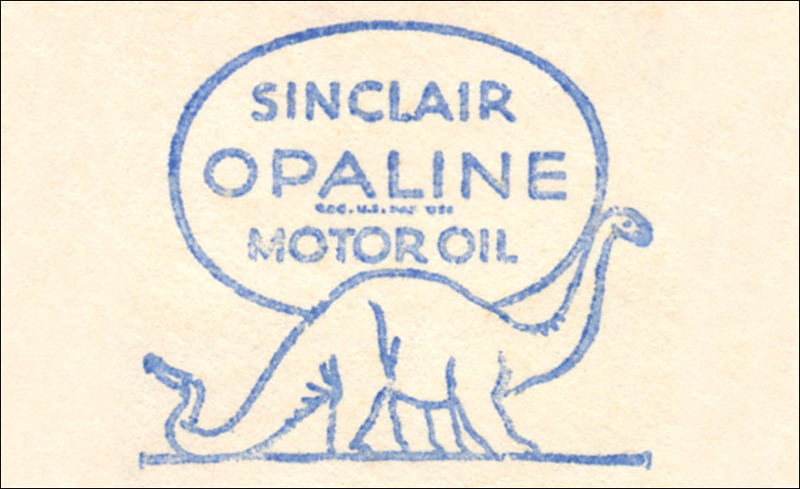 This design utilizes an oil can as the main theme with the image of ‘Dino’ being a small detail (similar to a design used in Belgium). Used during 1963. Comes in only one type. 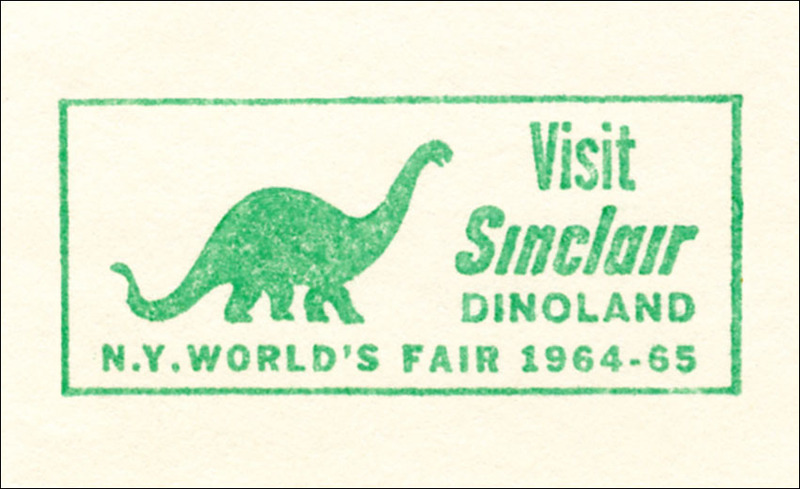 This design was an advertisement for the Sinclair Oil Company’s ‘Dinoland‘ pavilion at the New York World’s Fair. Used from 1964 through 1965. Comes in two types. 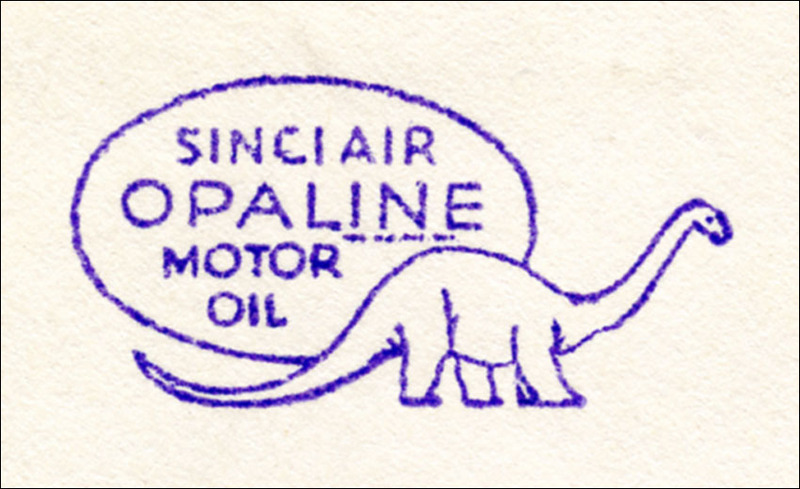 The name ‘Dino’ is in text and no illustration of the dinosaur is part of the design. 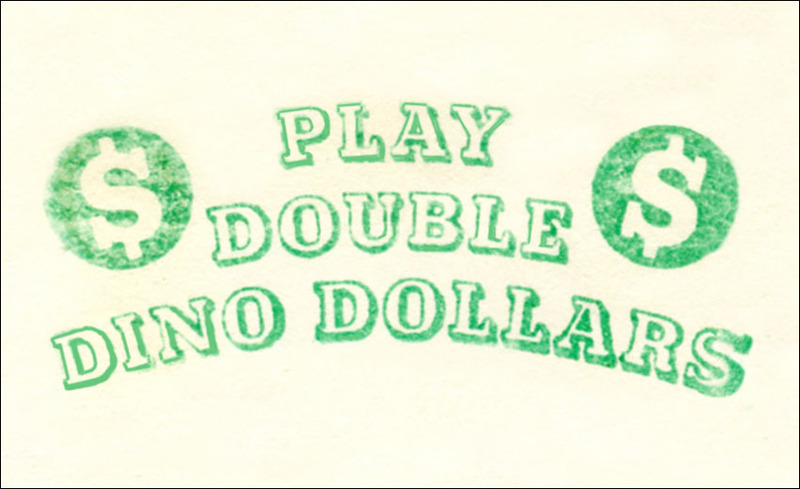 The variation occurs in the wording: ‘Play Double Dino Dollars’ or ‘Play New Dino Dollars’. 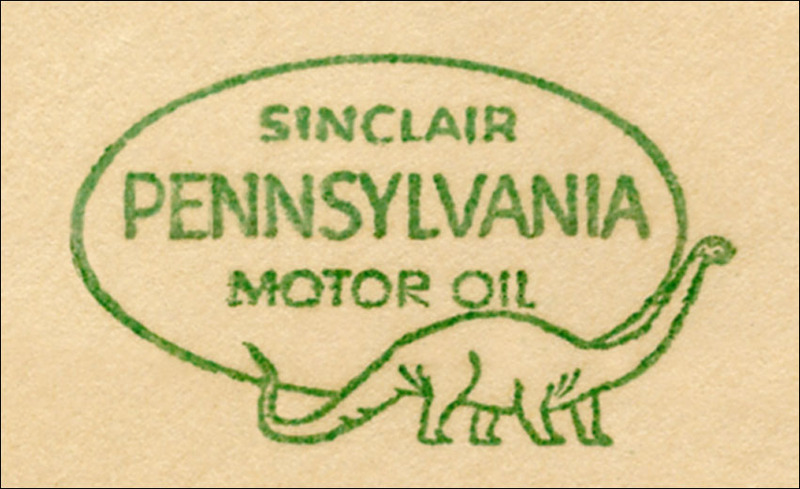 Used during 1968.